The MSI MAG271CR aims to provide a better gaming experience through its added features and gamer-centric design that’s sleek and functional. The product still uses VA technology which is known to produce extreme vibrancy and contrast at the expense of pixel response times and blur reduction. The MSI MAG271CR improves on the formula found in previous models to create a more responsive and attractive offering for the competitive gaming market. The MSI MAG271CR adopts its predecessor’s nice-looking design formula but with a few added twists and changes which users will appreciate. The display is still bezel-free on three sides, save for bottom bezel which has a nice, brushed gunmetal finish. 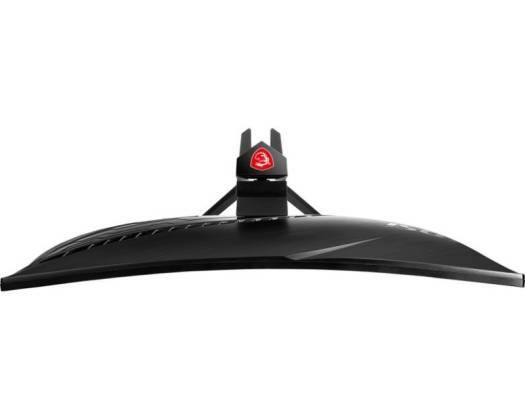 The overall appearance of this model would make it ideal for triple monitor setups. 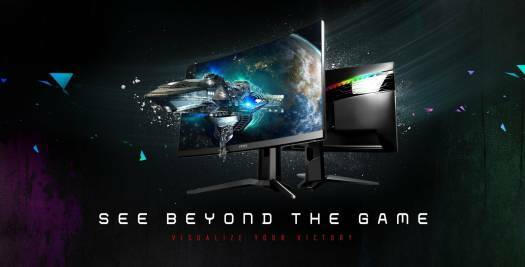 One of the changes n this model is it doesn’t include the SteelSeries GameSense-reactive LED strip at the bottom bezel. We like the cleaner look, but the addition of RGB LEDs which respond to customization and notifications can be invaluable for today’s gamers. The rear panel of the chassis has a beautiful texturized finish at the upper half and a matte smooth surface on the opposite. 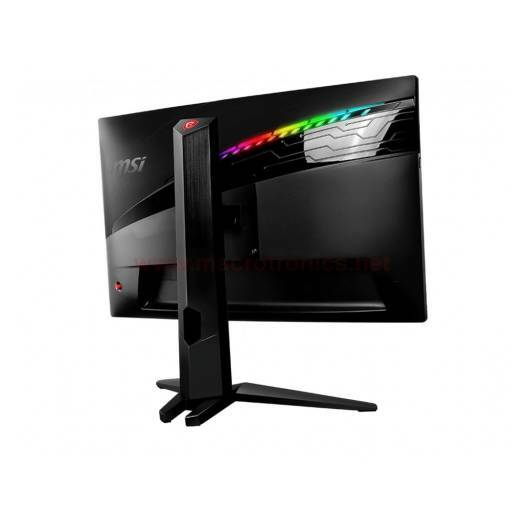 On this side, you will find the monitor’s RGB lighting strip which responds to MSI’s Mystic Lighting controls. You need to download this app to take advantage of the different effects, plus you also have to sacrifice one USB slot and connect it to your PC. The proportions of the MSI MAG271CR is more subdued than previous models, starting with a downsized footprint and the slightly sleeker chassis. 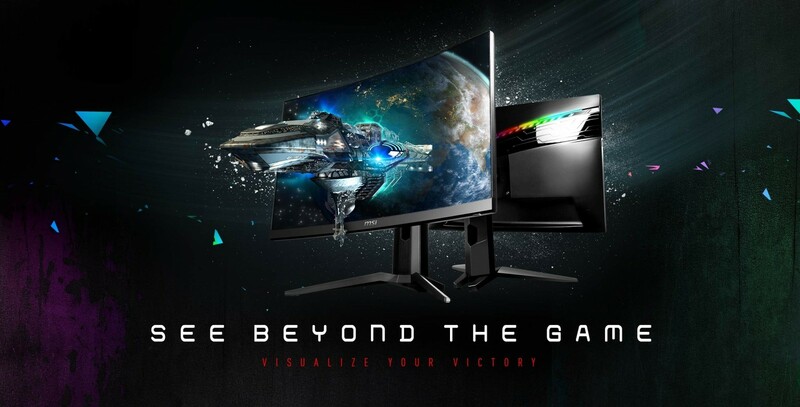 The monitor also weighs less than previous models without sacrificing build quality. 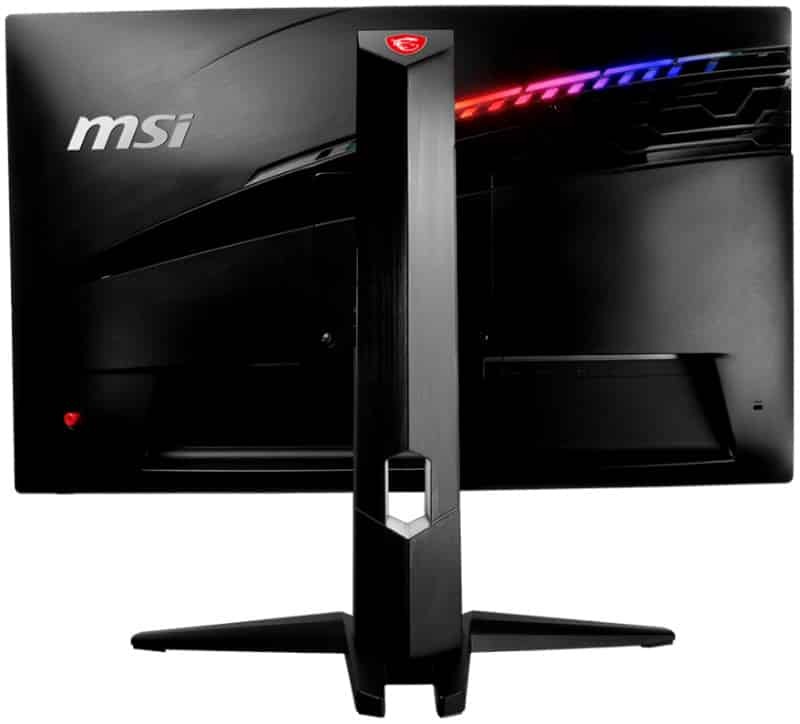 The monitor stands reasonably stable, and there is no doubt that MSI has gone forward with the quality of their display products. The redesigned stand with a Y-shaped base consumes less space on desks while looking sleeker and better. The only weird aspect for the mechanism is it doesn’t include rotation, despite being a flagship offering. You can still adjust the height and tilt the monitor, but pivoting is unnecessary since this is a curved display. Thankfully, the MSI MAG271CR is VESA compatible if these ergonomic omissions bother you. You can easily remove the stand to reveal 100 x 100 bolt holes, allowing attachment of various aftermarket options. Connectivity is one of the MSI MAG271CR’s strong suites thanks to the well-equipped I/O panel. The layout includes DisplayPort 1.2, dual HDMI 1.4 slots, and three USB connectors. You need to use the DP slot if you want to run at 144Hz, but the HDMI connectors are valuable if you also play console games on the PS4 or the Xbox One. The use of a joystick button adds convenience when accessing the OSD, but what completes the package is the headset hanger at the side. The nifty gadget pops out of a slot to hold your cans in place when the PC is idle. Frankly, all gaming monitors should have this minor feature which saves gamers from the need to buy an expensive stand. 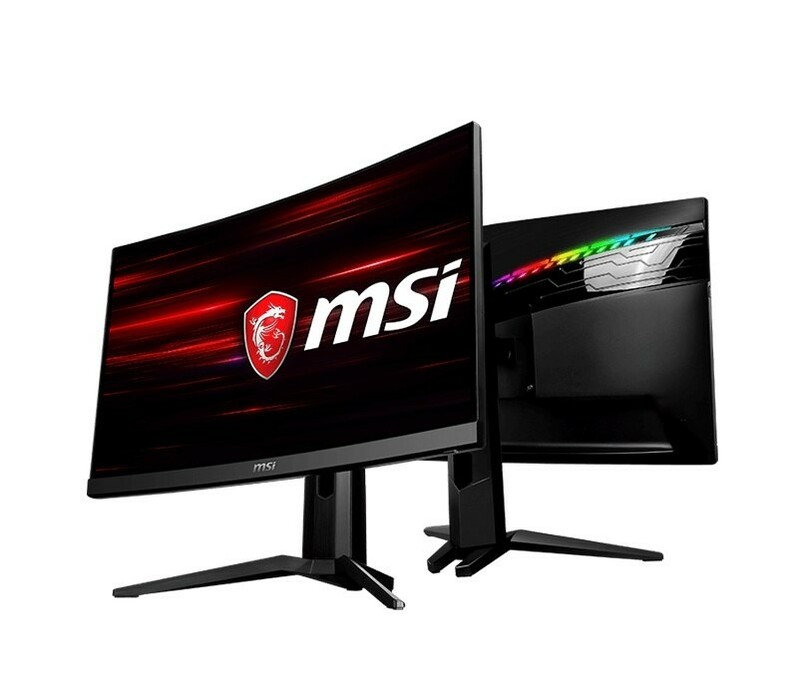 The MSI MAG271CR sports a curved, 27-inch VA panel with a 1920 x 1080 resolution, 144Hz refresh rate, and a 4ms response time that can be boosted with the MPRT feature. The monitor also includes an enhanced backlight for more vibrancy and a brighter, 300cd/m2 output. The mix of specifications is interesting since it brings the monitor into pseudo-HDR territory if it weren’t for the limited backlight. The initial impression you would get from the MSI MAG271CR when you use it for the first time is it’s extremely vibrant. The pixel density is looser than the ideal, but the comprehensive gamut coverage and high contrast output is immediately apparent. The screen looks great for movies and games, but you can’t tone it down to sRGB levels for photo and video editing. A colorimeter will reveal the MSI MAG271CR’s impressive capabilities save for a few errors which you need to manually correct. The display is able to produce 115% of the sRGB gamut, adding the punch to the different shades on the screen. However, there is a slight bluish tint due to the cool color temp which reaches around 8000K. You can correct this by reducing the blue hue in the MSI MAG271CR’s OSD, or you can calibrate it with a colorimeter. However, for most users, this won’t be necessary, since the accuracy is already pretty solid at DeltaE 1.2. You only need to tone down the blues in the color temp option of the display, and you should be all set. The MSI MAG271CR is also capable of fantastic contrast with its average that sits around 3800:1. Most VA monitors start at 1500:1 to around 2000:1, giving this model a huge advantage if inky blacks and low-light visibility are priorities. You can also tweak the monitor’s contrast slider to your liking to pump it up further, but take care not to push it too far which will result in some crushing. The monitor’s gamma isn’t too far from 2.2, so there is actually no need to use a colorimeter. However, we know some gamers prefer murkier or lighter images, so the ability to manually adjust the setting is crucial to any gaming display. Unfortunately, the MSI MAG271CR doesn’t include the setting. We’re also glad the review unit of the MSI MAG271CR showed no issues in panel uniformity. Brightness across the segments of the screen did not exceed 4% in illumination variance, while color deviance stayed within 2%. The monitor looks excellent overall without any backlight bleeding or undersaturated quadrants. The MSI MAG271CR is advertised to have a 1ms MPRT feature which is just a fancier backlight strobing solution for reduced blurring. VA’s widely-known flaw of slower pixel response times is still apparent in this model due to some noticeable blurs when panning the screen too fast. The MPRT add-on did correct most of these flaws, but pushing the booster too high will significantly reduce the monitor’s brightness. The screen will look too dark for some users, but we are not saying its fully unusable when MPRT is set to its full power. 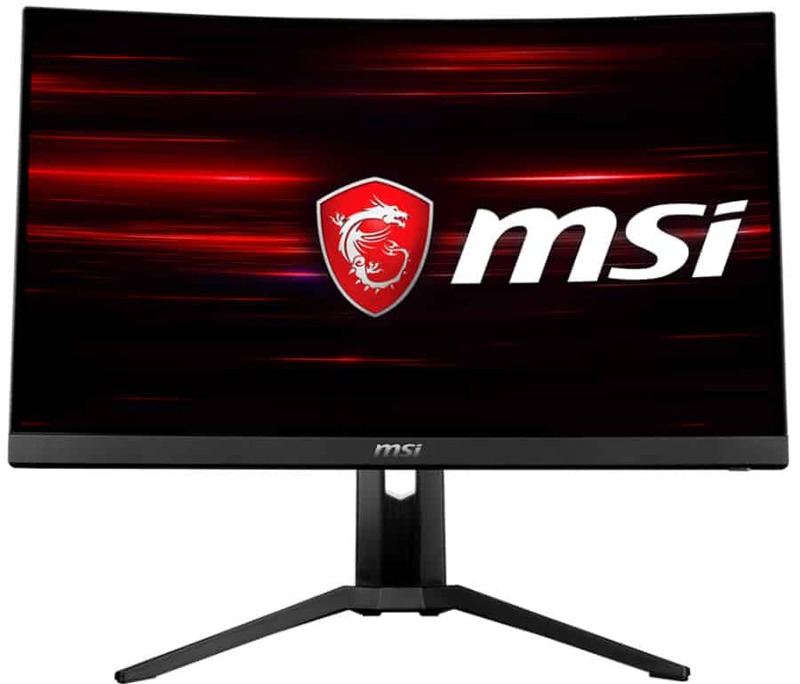 We just wish MSI added a slightly more potent backlight that sits in the 400-500cd/m2 range to give the monitor decent illumination when strobing is active. Finally, the MSI MAG271CR is FreeSync-compatible, making it a perfect match for cards like the RX590 or the Vega 56. Input lag is excellently limited to 10ms, enabling the device to be suitable for E-Sports applications and competitive gaming events. 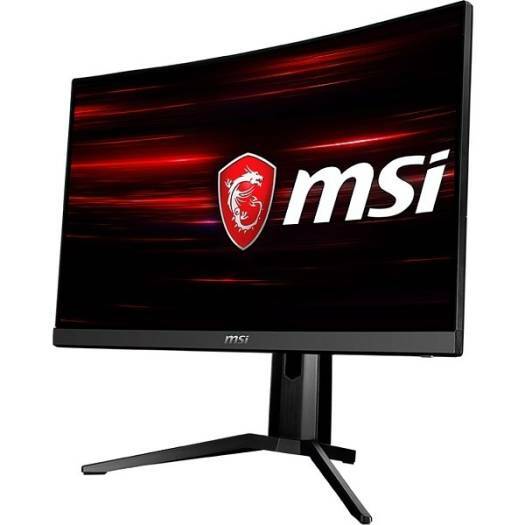 We offer express delivery to Dubai, Abu Dhabi, Al Ain, Sharjah, Ajman, Ras Al Khaimah, Fujairah, Umm Al Quwain, UAE for MSI Optix MAG271CR Gaming Monitor 27", 1920x1080, 144Hz, 1ms, VA Panel, Curved Gaming Display, Anti-glare, Display Color 16.7M, AMD FreeSync, Mystic Light RGB, Aspect Ratio 16.9 | MAG271CR. We offer the best price for MSI Optix MAG271CR Gaming Monitor 27", 1920x1080, 144Hz, 1ms, VA Panel, Curved Gaming Display, Anti-glare, Display Color 16.7M, AMD FreeSync, Mystic Light RGB, Aspect Ratio 16.9 | MAG271CR in Dubai, UAE. Buy now with the best price!